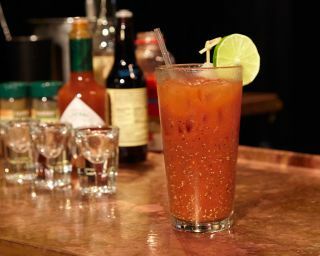 The "Bloody Moony" cocktail is a spiced-up Bloody Mary. In celebration of the total lunar eclipse taking place this weekend, we've cooked up some moon-inspired cocktails that are sure to spice up your lunar viewing party. This Sunday night (Sept. 27), skywatchers are in for a stunning lunar event: The moon will pass into the shadow of the Earth, creating a lunar eclipse and giving the planetoid a blood-red tint, which is why it is sometimes called a Blood Moon. In addition, this also happens to be a supermoon and a Harvest Moon. On Tuesday (Sept. 22), we headed down to the Rumpus Room to taste-test the lunar concoctions that Hom had cooked up. It was 1 p.m. and I hadn't eaten anything in about 3 hours, which means I'm starting to think about some of these moon-themed snacks. The first cocktail was inspired by the Blood Moon. During a lunar eclipse, light from the sun passes through Earth's atmosphere before it hits the surface of the moon. The atmosphere acts as a color filter and turns the sunlight red, so the moon also appears to turn a shade of crimson. The cocktail, dubbed a "Bloody Moony," is a very fancy (and very delicious) Bloody Mary. The skewered white onions add a moonlike element. I was worried that all the spices in this drink would be overwhelming, but it was actually incredibly smooth (you could easily halve the amount of spices if you prefer a milder drink). The thickness of the tomato juice, plus all of the spice and the strong aroma make this creation more of a snack than a cocktail — which, when you think about it, is very efficient. I just realized how hungry I am, so I'll go ahead and take a few more sips. Next up is the Harvest Moon. The "Harvest Moon" cocktail combines sweet apple liquor, cinnamon whiskey and fresh apple cider to capture the essence of fall. A Harvest Moon refers to the full moon that takes place closest to the autumnal equinox — which took place yesterday (Sept. 23). This drink is extremely fitting (it even has the golden-yellow color, just like a real Harvest Moon). The taste of the cider and the applejack comes in first, and together with the graham crackers it's a wonderfully sweet start. The drink finishes with the taste of whiskey, and leaves behind a hint of cinnamon. If you wanted to tone down the sweetness you could leave out the applejack. It's a nice, small cocktail so it's easy to finish the whole thing. The "Supermoon" cocktail puts a twist on the classic margarita by substituting the traditional citrus mixer with cream of coconut. This drink is big and white, just like the supermoon, which refers to a full moon that takes place when the moon is closest to the Earth in its orbit (also known as perigee). A supermoon appears slightly larger in the sky than a regular full moon. For the cocktail, if you shake the ingredients enough, you'll get some foam on the top, and the bubbles kind of resemble craters on the lunar surface. Look at those adorable little moon craters! This might be my favorite of all the moony cocktails because I love coconut, and this is basically coconut meat in liquid form. I'm going give the rest of this to our video crew because otherwise I think I'll drink it all in the next two minutes. Did I mention what a great crew we have? Great crew! Love these guys! The final cocktail is the Eclipse Night, a visually stunning concoction that attempts to replicate a lunar eclipse set against the glittering backdrop of the cosmos. It involves a very special liqueur called Viniq. It's purple and sparkly and when you move it or shake it, the way it shimmers is mesmerizing. And I'm not just saying that because I've been drinking. I mean, look at it. Did you look at it? This gorgeous drink uses Viniq liquer to give it a cosmic color. The apple slice serves as the moon. Ladies and gentlemen, this is how you make a lunar eclipse in a glass. The apple slice has the burnt red color of the moon during an eclipse, and the deep, shimmery liquid looks like you're staring into the depths of the cosmos. This gorgeous mixture tastes like berries. Just berry juice, there's almost no alcoholic taste to this one. Hey, make one of these for the crew. Great crew! Why don't we do more cocktail stories? Guys, look, I took a bite out of the moon! Hey, can I have another one of those coconut Supermoons? You guys, be sure you visit the Rumpus Room, they'll make you a moon cocktail! Lemme see that bottle of sparkly alcohol again.